UMAVA usually provides about $5,000 annually in scholarships to graduating high school students. UMAVA's scholarships are based on need and merit. Click Here to VISIT US at FACEBOOK. Governor Brown Joined by former Assemblywoman Quirk-Silva to Visit Designated Site for an Orange County Veterans Cemetery. Made possible by Hon. 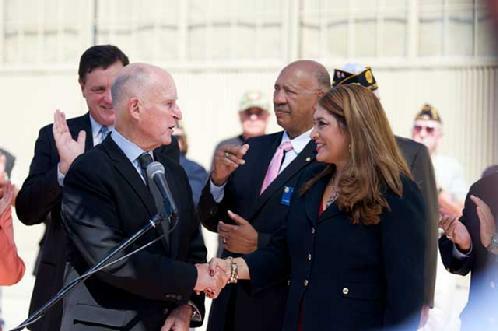 Quirk-Silva's strong leadership as Chair of Veterans Affairs for CA Assembly. Inspiring Tomorrow through education and advocacy. Family - Show Love, Respect, Honor and Gratitude for our Families, and for the Families of those who selflessly and with love sacrificed their lives for our life, freedoms and basic human rights. May our Love, Respect and Warm Embrace bring comfort to their healing hearts, as they honor and as we honor, the memory of their loved ones! Friendship - Remember that we are a community of friends with unbreakable bonds, forged in battle or in service to nation and by our personal actions, and that we rejoice in the presence, or in memory of those, before us! Dedicated sponsors who believe in recognizing the sacrifices of the American Veteran, in general, and the Hispanic/Mexican-American Veteran in particular. Establishing programs and identifying benefits that are made available for Veterans and their families. Please feel free to explore our Web site and visit us often to find out more about us, and the programs we offer. UMAVA meets every THIRD SATURDAY from 9:00 to 11:00 a.m.
UMAVA is a registered Not-for-Profit.